Full-blooded distortion – Pit Viper is a solid state overdrive for hard-boiled musicians. The Pit Viper’s circuit can generate clean, beefy signal boosts. However, its true strengths lie in aggressively screaming distortions with a tangible character. – This is not a module for wimps! Toxicity: Gain potentiometer – Please turn up for heavy distortion. Hiss: Tone knob – Turn clockwise to cut the treble. 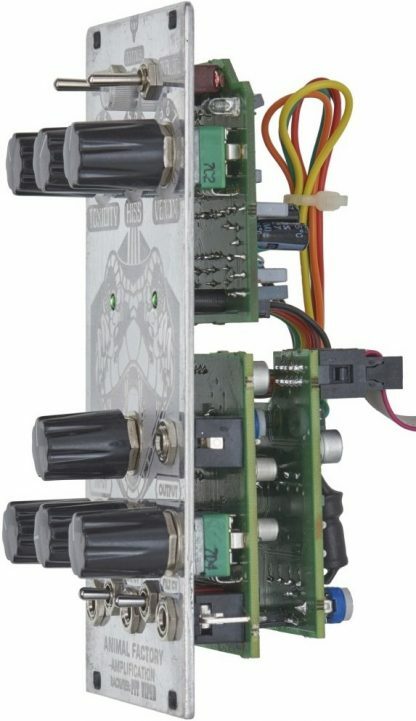 Fear: Three-stage soft clipping switch – Activates normal soft clipping or a more tube-like version with less treble. Malice: Three-stage hard clipping switch – Activates beefy hard clipping or a spongier version with less treble. Bite: CV input plus attenuator to cut the high frequency range. Without a cable plugged in, the knob can be used for adjusting the treble manually. Saturation: CV input plus attenuator and on/off switch to influence gain and saturation. Furthermore, there is a trim potentiometer on the circuit board, which can be used to adjust the gain. Finally, one important note from the manual: Please keep the Viper away from cats! – If there is not a cat in your studio, please adopt a four-legged friend! Scratches on the front panel are part of the Pit Viper’s design!